On Wednesday in Venice, Seabourn will christen the Seabourn Odyssey, its first newbuilding since the Seabourn Pride almost twenty years ago, in November 1989. Earlier this month, on the 5th in Genoa, Costa christened two ships together, the Costa Luminosa and Costa Pacifica. Although NCL had christened the Norwegian Star and Norwegian Sun together in Miami in 2001, they had come from different shipyards while the Costa ships were both built in the same yard. And on the same day as the Costa duo were named, but at St Nazaire, NCL's new Norwegian Epic received her new top section, a huge block of 60 suites that has been installed above the bridge. 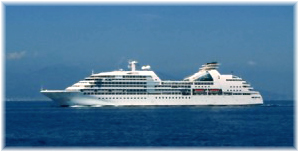 Meanwhile, Pearl Seas Cruises has announced a delay in the delivery of its new Pearl Mist until 2010 rather than 2009. 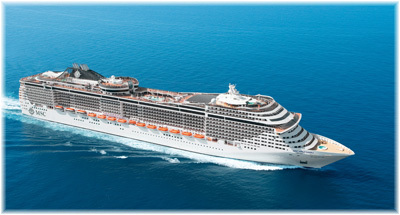 And while the Celebrity Equinox left Papenburg for the sea this weekend, the new MSC Splendida will precede her into service when she is named in Barcelona on July 12. Built at the T Mariotti shipyard, Seabourn took delivery on Friday of the new 32,000-ton Seabourn Odyssey, first of three sister ships, which will officially be named on Wednesday. She is the first ultra-luxury ship to be introduced in six years and, in a departure from tradition, all passengers on her maiden voyage will become her sponsors. Among other things, she will be the first Seabourn ship to perform a world cruise since the Seabourn Sun, the former Royal Viking Sun and today Holland America's Prinsendam. But where the Seabourn Sun had been adopted from another product in 1999 and then transferred to Holland America in 2002, the Seabourn Odyssey provides a custom-designed Seabourn ultra-luxury product. The Odyssey's 450 guests carried in 32,000 tons compare to the Sun's 740 guests in 37,845 tons, producing a passenger space ratio of 71 for the Odyssey compared to just 51 (high at the time) for the Sun. This is almost 40% more space per passenger. Delivery of the new ship will also allow Seabourn to base ships in Asia year-round, with both the Seabourn Pride and Seabourn Spirit offering a range of new ports and itineraries there between December 2009 and April 2011. Exotic ports in all of China, Japan and Indonesia will feature among these cruises. And when the Seabourn Sojourn, next sister to the Odyssey, is delivered, Seabourn will incressingly use its exisiting ships as pathfinders to develop new itineraries to sustain demand for its product. Twin christenings are generally reserved for warships, but the Costa duo will be the second pair of cruise ships to be named together in ten years. An earlier double naming ceremony planned for Princess Cruises' Emerald Princess and Royal Princess (actually a renaming for this ship) at Santorini in May 2007 had been called off after the sinking of Louis Cruise Lines' Sea Diamond that April. The unlucky Royal Princess was renamed instead at Portofino and last week suffered an engine room fire that has forced her to cancel that cruise and the one to follow while she undergoes repairs. Of the two new Costa ships, the 92,600-ton 2,260-guest Costa Luminosa is a follow-on to the Costa Atlantica class, and the 114,500-ton 3,004-berth Costa Pacifica a follow-on to the Costa Serena. Ironically, the Pacifica, although the larger ship, is actually eight feet shorter than the Lumunosa, but her chunky hull, based on the original Carnival Destiny, means she is ten feet wider. At 38 gross tons per passenger compared to 41 on the Luminosa, the Pacifica also has a lower passenger space ratio. Costa chairman and ceo Pier Luigi Foschi presided over the ceremony and complete with an acrobatic air display from the Italian Air Force (the Italian military are big customers of Fincantieri) and a recording of a Pavorotti version of Nessun Dorma. The Costa Luminosa was named by world and Olympic fencing champion Valentina Vezzali, while the Costa Pacifica was christened by popular concert and recording artist Noa, a Commander of the Order of the Star for Italian Solidarity for her musical achievement. In keeping with tradition, the two godmothers cut the ribbons and let two bottles of Aneri prosecco wine break against the bows of the ships. The Costa Luminosa, as the smaller and roomier ship, is aimed at a slightly more upmarket audience, for cruising out of northern Europe in the summer and from Dubai by winter, and is Costa's new flagship, while the larger Costa Pacifica, Italy's largest cruise ship, will tend to the more mainstream Mediterranean cruise market from Italy. Pacifica is supposedly decorated with what one observor called "Farcitechture," a name coming from Carnival interior designer Joe Farcus, long known for his use of fantasy and neon, among other things. Both ships are fitted with large new Samsara spas. While this may be the first time that Costa have actually talked about market differention on different ships, its fleet does now include fourteen ships. Pearl Seas Cruises, the foreign-flag arm of American Cruise Line, meanwhile, has announced that its full 2009 season with its new 214-berth Pearl Mist has been cancelled and she will not now enter service until 2010. Launched by Irving Shipbuilding at Halifax in March, she is now at a fitting out yard in Shelburne NS, where attention is being paid to fitting out and correcting the faults which have delayed her delivery to Pearl Seas Cruises. Elsewhere, Ponant Cruises of Marseilles is negotiating to delay delivery of the second of its new 264-berth cruise ships, L'Austral, which is now being constructed by Fincantieri at Ancona, due in 2010, until a few months into 2011. Le Boreal, meanwhile, is due to be delivered on schedule in May 2010. 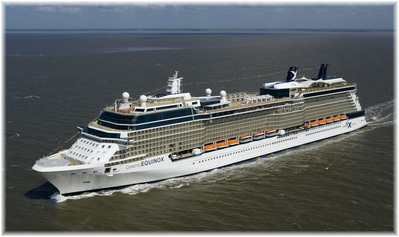 Next up is Celebrity Cruises' new 122,000-ton 2,850-guest Celebrity Equinox, second of five new Solstice class ships. These are the three ships that can boast of lawns on their top decks. This Saturday, the Equinox left her builder's yard at Papenburg, Germany, 26 miles from the open sea, for her backwards conveyance down the Ems River towards Emden, where she arrived in the early morning, and her sea trials. Ten days of inaugural events start on July 19, including the Passenger Shipping Association's annual dinner on July 26, and The Cruise Examiner will be there to report on the new ship. Celebrity Equinox then departs Southampton on her maiden voyage on July 31, heading for Scandinavia, and on August 8 sails for Civitacecchia for a summer season in the Mediterranean. Celebrity ceo an Hanrahan managed to make the Equinox's river conveyancing to sea after speaking at the UK Cruise Convention in Dover earlier last week. The third of these new ships, Celebrity Eclipse, will be introduced in April 2010 and will be based in Southampton. Like Costa with its Samsara spas, all three Celebrity ships will include extensive Aqua spa facilities. Beating Celebrity Equinox into service will be MSC Cruises' latest, the 133,500-ton MSC Splendida, which will be the seventh MSC ship for which Sophia Loren will act as godmother. Splendida, a 3,300-berth sister ship of MSC Fantasia, will leave here builder's yard at St Nazaire on July 4 for Vigo, Lisbon, Malaga, Palma and Marseilles before finally being christened in Barcelona on July 12. In commemoration of her being named in Spain, she will also be sponsored by Spanish tenor Jose Carreras. Unlike her sister ship, the Splendida will include two bowling alleys among her divertissements, but both will have interiors by De Jorio Design. The first blwoing alleys at sea were installed in French Line's Ile de France in 1926, an earlier product of the same shipyard in St Nazaire, while more recently the Norwegian Gem and Norwegian Pearl have come with bowling. In the case of the Splendida, however, she will be totally different inside from MSC Fantasia, with her own interior design. Both ships include MSC's new private Yacht Club accommodations on top of the ship. As with Celebrity Solstice and MSC Fantasia last year, there are bound to be some interesting comparisons between Celebrity Equinox and MSC Splendida, but the difference is that Equinox is almost a direct copy of Solstice while Splendida will have a personality of her own.